Our first frost was this week, so I cut down my tomato plants and rescued a large bowl of ripe yellow pear cherry tomatoes and two bowls of green tomatoes of various types, shapes, and sizes. A couple of years ago when I complained that I totally failed at making Fried Green Tomatoes (I may be the world’s worst fry cook), a friend suggested I try an Indian recipe. She sent me several recipes similar to a dish her mother makes. This was the one I used because I had all the ingredients and knew all the cooking techniques required: Hirvya Tamatyachi Bhaaji (Green Tomato Sabji) at Aarti’s Corner. Since the blog where that recipe was found has now retired, I’m going to reproduce the full recipe here. The only changes I made were to make the suggested substitute of sugar for jaggery, to convert the number of tomatoes into pounds, and to clarify some instructions. Also, I quadrupled the recipe because that’s the quantity of green tomatoes I have available at the end of the growing season. This is a dish that, like salsa, will keep for weeks in the refrigerator. The inspiring recipe suggests serving it with rotis or bread. But I’ve found a ton of other uses for it. A can of tuna mixed with about a quarter cup of this sabji makes the tastiest tuna salad sandwich ever. A dollop of it jazzes up a bowl of sweet potato or squash soup — perfect for fall! It will form the basis of the sauce for my Veggie Pasta for the next month. 1. In a very large pot on the stove, heat oil. Add mustard and cumin seeds. 2. When the seeds start sputtering, add onions and stir. Cover pot and turn heat to low. Check and stir every few minutes, cooking until onion is translucent. 3. Stir red chili powder and turmeric into onion mix. 4. Add chopped tomatoes, stir and cook covered, medium-low, for 5 minutes. 5. Add sugar and salt, stir well and continue to cook covered on medium-low, stirring occasionally, until tomatoes release their liquid and soften, about 15 minutes. 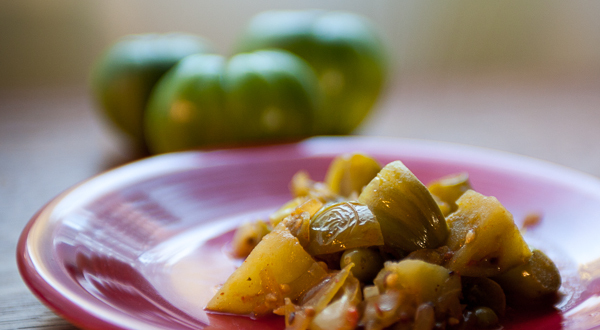 What is your favorite way to eat green tomatoes? Check Weekend Cooking at Beth Fish Reads for links to recipes, cookbook reviews, and more. I’m also linking this post to Saturday Snapshot at West Metro Mommy Reads because the photos were inspired by the class we took a couple of weeks ago (Environmental Portraits Photography Workshop) and the photography book I reviewed at the end of last month (Book Review: Plate to Pixel by Helene Dujardin). Visit her post today for links to more pictures! Back home, we had an annual Tomato Fest in September, and until I went there I had never heard of green tomatoes. Your recipe looks tasty. I can’t pronounce the name but this sounds wonderful. I am going to have to look for some green tomatoes at the farmer’s market and try it. I am always on the lookout for good meatless dishes. Thanks for sharing this recipe. What a wonderful way to use your green tomatoes (great photo of you BTW)! Like the tuna salad idea especially :). I’ve always wanted to try fried green tomatoes!! this recipe sounds very tasty, love Indian food. I love any recipe with tomatoes-one of the advantages to living in California is we get great tomatoes all year-I think I have a slice every day. Oh yummmmmm!!!!! My kind of salsa! I don’t have any go-to green tomato recipes, so I welcome this. This looks fantastic — great idea for not wasting the end of the harvest. My mother-in-law makes a sweet green tomato pie when she has green tomatoes to use up — my older daughter just loves it! Yummy!! I love anything tomato and could eat them everyday, so I might have to try this! That looks fabulous Joy, and it’s so great that you got to use up the tomatoes rather than letting them go to waste just because the weather got in the way. What a great post. You have included everything: a lovely photo and a recipe. would you believe I’ve never tried green tomatoes – they don’t have them in our shops either. I’ll have to look out for some. The only thing I’ve ever tried with green tomatoes is Green Tomato Mincemeat. Surprisingly good, but very sweet. This savory dish looks great. This seems very like a chutney. I love using these types of relishes to add flavor to all kinds of dishes. I am soooo impressed by this post! Perfect photos and your portrait is just lovely! 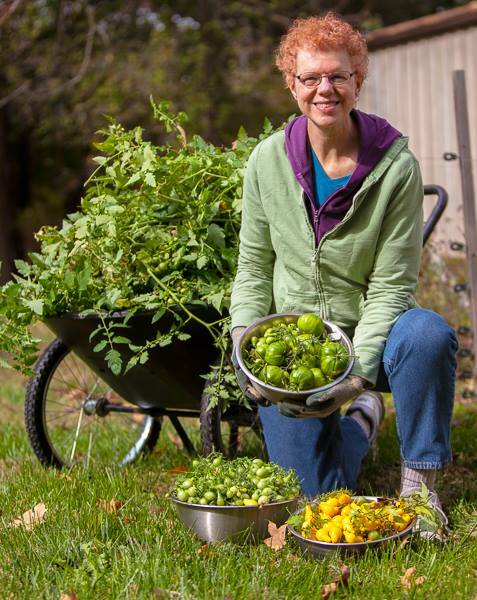 That’s a wonderful photo of you and your harvest! Every year we plan to pick all the green tomatoes still left in the garden and do something with them, but once again, we didn’t do it before the cold weather hit! This recipe has been used in our family for many years. My problem now is that I have trouble finding green tomatoes! The recipe is very simple, but I salt and pepper the tomatoes a little and add a little white flour to the cornmeal. My mother would sprinkle a little sugar – white or brown – on the tomato after she turned them. When the sugar melts and is crusty the tomato is done. Oh this sounds delicious! We have a crop of green tomatoes too and, while we do enjoy them fried, I’m looking for other ways to cook them. Thanks for sharing this recipe! It is my least favorite job but I need to clean my garden out as well and see what has survived our little frosts. This recipe looks interesting as I am not a fan of fried green tomatoes.